“God bless you, you’re nuts!,” Deanna Frey, Executive Director of the WCAA here in Cheyenne, Wyoming, said in the most appreciative way. Riding The Kindness Bicycle and driving The Kindness Bus to accomplish as much as I can for the good of children struck a chord with Deanna. 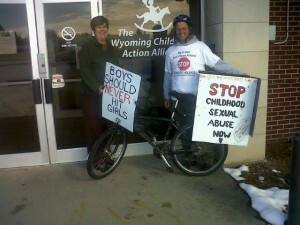 She is working in many ways to make the lives of children, here in Wyoming, as safe as humanly possible. The WCAA oversees Professional Development for child care workers, Data Collection to protect children and they are a member of Voices for America’s Children helping to better serve the needs of children through active advocacy. Deanna is very active in any legislation that has the possibility of adversely or positively affecting children, especially on the state level. She is the perfect person for the job. My ride today, took me into the downtown area of Cheyenne. Being the state seat, I decided to stop by Governor Matt Mead’s office and drop off some of the material I distribute. I have been hearing about the budget cuts in Wyoming affecting women and children. Cutting funding to Domestic Violence and Childhood Sexual Abuse programs is something that should not take place. This entry was posted on Thursday, October 27th, 2011 at 7:17 am	and is filed under Kindness. You can follow any responses to this entry through the RSS 2.0 feed. You can leave a response, or trackback from your own site.